Summer Radio - Aux arbres citoyens! We are continuing our offering of a series of pithy little genealogy comments, in French, for radio, entitled "Mon Histoire, ma famille, La Minute-Info de la généalogie", produced by SEPREM. Today's offering is "Aux arbres citoyens! Ou pourquoi il est important d'un point de vue sociétal de retrouver ses racines " (To the [family] trees, citizens! Or why it is important to society that we find our roots). A discussion with the psychoanalyst, Serge Hefez. Capital: Bourg-en-Bresse. Archives Numériques Départementales de l'Ain. Online: parish registers, civil registers, censuses. Wonderfully they also have put up the Tables de Succession, (lists of those who died and whether or not they left a will) and the Matricules, (military recruitment documents) for some communes. Being added in stages are the all-important notarial document registers. Capital: Laon. On a very nice site that works well: parish and civil registrations, land records and maps, and many images of historical and genealogical value. There is a nice section on genealogy to help one get started. Additionally, it is possible via a different search page to see all documentation relating to a particular commune. Capital : Moulins The parish and civil registrations for over 300 communes are now online and free. One must click an agreement form before access is allowed. Nice site. Capital: Digne-les-Bains Online: parish and civil registers, annual indices, ten-year indices, censuses, land records. Capital: Gap. Online: parish and civil registers through 1916, marriage banns, ten-year indices. Incredibly helpful people when contacted by e-mail; they really go out of their way to help further one's research. Capital: Nice. Parish and civil registrations from the 16th century to 1914. Capital: Privas. Online: parish and civil registers, ten-year indices, land records, Protestant registrations, military registers, and censuses from 1791 to 1911!!! Capital: Charleville-Mézières. Online: the ten-year indices with a list of all communes, land records, parish registers and civil registers from the 16th century to 1890. Military conscription lists from 1867 to 1921, with a new index that can be searched by the conscript's name. Capital: Foix. Finally! Online: Parish and civil registrations from 1551 to 1892, with ten-year indices up to 1902, and military conscription lists from 1884 to 1918. Capital: Troyes. Online: ten-year indices, post cards of various towns and villages, land records, parish and civil registrations from 1552 to 1915, military enlistment records, probate indices (tables des successions), census returns from 1820 to 1931. Additionally, the Fichier Chandon has about 8000 names and biographical notes on families of the region. Works in Progress: 1) a collaborative index to the names on the census returns; 2) a surname index to the registrations -- now pushing 600,000 names. Capital: Carcassonne. Online: parish and civil registrations from 1547 to 1872 and some ten-year indices. Just up: military conscription lists. Capital: Rodez. Online: parish and civil registrations from the 16th to the end of the 19th century. There is a plan afoot to put notarial records -- not just indices -- online gratis. NEW: military recruitment lists from 1887 to 1921. Capital: Marseille. Online: parish and civil registers, land records, censuses from 1836-1931, old post cards, military recruitment registers from 1872 to 1912. Probably the worst AD website of them all. Capital: Caen. Online: parish and civil records and the ten-year indices and annual indices. Also some interesting pictures of the Normandy invasion. Capital: Aurillac. Online: parish and civil registers, ten-year indices, censuses, alphabetic indices to military recruitment lists and the lists as well, photographs, and notarial records and Holocaust records that relate to Cantal. In 2010, the website won a prize for the way it is possible for users to index collaboratively the civil registrations. Capital: Angoulême. Online: census records for 1842 to 1872, land records, teachers' notebooks, church inventories, old post cards of local towns, villages and sites. Parish and civil registrations are now online. At long last, the charge has been dropped and the site is now free to use. Capital: La Rochelle. Online: parish, Protestant and civil registers, post cards, photographs of the Second World War, notarial records and entry lists (répertoires), military recruitment lists from 1859 to 1921, admiralty records, employment contracts for those sent to America (engagés) from 1606 to 1758, and quite a lot more. Capital: Bourges. As with many, but not all, you must create an account. This will gain you access to parish and civil registrations, censuses, maps, military enlistment registers and indices to them. They have embarked on a big collaborative indexing project. Capital: Tulle. Online: ten-year indices from 1802 to 1902, parish and civil registrations for all communes from their beginnings to 1902, EXCEPT for Brive-la-Gaillarde (see their own website: http://archives.brive.fr), census returns from 1906 to 1936, military recruitment lists, alphabetic death and will registrations to 1940, maps. Capital: Ajaccio. All new! Online: Parish and civil registrations from 1548 to 1914, probate tables, land records and census returns. Very nice. Capital: Bastia. Online: Maps, civil registrations from 1793 to 1902. Capital: Dijon. Online: parish and civil registers, ten-year indices, censuses 1800 to 1936, indices to the military recruitment lists and the lists themselves from 1867 to 1921, court and judicial records, administrative records,maps, tables to notarial records, succession tables. NEW AND FABULOUS: scans of 170 registers of notarial records dating from 1310 to 1475! Capital: Saint-Brieuc. Online: land records, parish and civil registrations, census records to 1906, will indices, post cards, posters, photograph collections, military recruitment lists from 1867 to 1909, scans of old newspapers, répertoires (chronological indices) to notarial records. Capital: Guéret. New website! Online: Parish and civil registrations, maps, posters from the Second World War, census returns, military recruitment lists, and -- very nice -- alphabetic indices to inheritances. Capital: Périgueux. New website! Online: historic maps, ten-year indices, parish and civil registrations, census returns through 1896, military conscription lists from 1887 through 1921. Capital: Besançon. Online: Ten-year indices. Rumours that the censuses will soon be online. DREADFUL search facility. NEW! Civil and parish registrations begin to appear. Capital: Valence. Online: parish registers, ten-year indices, civil registers up to 1852, with some up to 1916, notarial archives, land records, military recruitment lists from 1865 to 1921, census returns from 1790 to 1911; also many finding aids. NEW: Protestant registers with indices! Capital: Évreux. Online: parish and civil registers, military recruitment lists, censuses, old postcards. Capital: Chartres. Online: Parish and civil registers, military conscription lists, censuses, probate lists, land registry records, electoral rolls, church plans. Capital: Quimper. Online: Maps, parish and civil registrations census returns, military recruitment lists from 1860-1913. Parish registrations from 1772 to 1909 have been indexed on FamilySearch. NEW: local maps with place names in Breton. Capital: Nîmes. At last! Gard has its own website, previously having relied heavily upon TéléArchives at Brozer.fr which have the municipal archives of Nîmes and a large number of archives for Gard. On Gard's own website at the moment there are only the military recruitment lists from 1887 to 1915. Still, a fine beginning! Capital: Toulouse. Online: Land records, parish and civil registers, military recruitment lists, marriage contracts from Toulouse from 1501 to 1739, censuses, insinuations from 1693 to 1790. The site is maddening in that images cannot be adjusted; there is no possibility to zoom in or out. The 1872 and 1886 census returns for Toulouse are being indexed by FamilySearch. Updates are ongoing and the site is improving. Capital: Auch. Online: Finding aids, historic maps, military conscription lists and census returns. Parish and civil registrations are not expected to be online before late 2015. Capital: Bordeaux. Online: Transcriptions of some parish registers, parish and civil registers and ten-year indices, maps, passport applications from 1800 to 1889, military recruitment lists from 1867 to 1921, register of deeds, wills, etc., 182 registers of the Admiralty of Guyenne, crew and passenger lists of departing vessels from 1683 to 1778. Click on GAEL to search. While there are some civil registrations for Bordeaux, most are on the website of the Bordeaux municipal archives. Capital: Montpellier. Online: Military recruitment registers, parish and civil registers, censuses, land records, notarial records, post cards, maps, municipal meeting minutes. NEW: Copies of the Land Registry records, showing transfers of ownership -- the Table des hypothèques -- are now online. Capital: Rennes. Online: Land records, parish and civil registrations for most but not quite yet all locations. For Rennes see the Archives municipales de Rennes. Capital: Châteauroux. Online: Finding aids, maps, parish and civil registrations to 1902, ten-year indices, census returns to 1901. NEW: Complete military recruitment records from 1859 to 1921. Capital: Tours. Online: Parish registers, ten-year indices, land records, old post cards and records of wills filed, military conscription lists. NEW: Land registers for Chinon, Loches and Tours from 1800 to 1955. Capital: Grenoble. Much improved! Online: Ten-year indices, parish and civil registrations to 1892, census returns to 1906, military conscription lists from 1856 to 1921, scans of WWI family records, treasury records from the 13th to the 15th centuries. Capital: Lons-le-Saunier. Excellent progress! Online: maps, postcards, historic photographs, parish and civil registrations from the 16th century through 1892, ten-year indices from 1802-1932, marriage banns and dispensation requests from the 18th century, military conscription lists from 1867-1921, registers of notarial records from 1694-1791, census returns from 1800 to 1911. This has to be one of the most helpful archives in the country. Capital: Mont-de-Marsan. Lots of problems with this site, and many efforts to repair them, finally leading to a new site. Online: Parish and civil registrations, military recruitment lists, maps, town meeting minute books. Capital: Blois. Online: parish and civil registrations, census returns, indices to military recruitment lists, maps. Capital: Saint-Étienne. Online: Ten-year indices, parish and civil registers from 1469 to 1909. Census returns from 1810 to 1911, maps, 1906 inventories of church properties, postcards, military recruitment lists from 1865 to 1921, newspapers from 1873. Capital: Le Puy-en-Velay. Online: Nice website which has parish and civil registrations, ten-year indices to same, military conscription lists, census returns, registers of notarial records. There is much, much more here than can be listed, so explore this site. Capital: Nantes. Online: Parish registers, civil registers, censuses, land records, maps, old post cards, notarial records, military enlistment registers, WITH a surname index to them! Do not waste your time contacting by post or e-mail, as they brusquely refuse to be of any help at all. Capital: Orléans. Online: Civil registrations from 1833 to 1902 are gradually being put online. About one third of all communes have been added. However, there are some that will never be online, for they were destroyed during the Second World War. Many communes have their own websites with their parish and civil registrations found online there. Nice new website, much improved! Capital: Cahors. Online: Parish and civil registrations to 1902, including clerk's copies, census records, succession tables, military registers. This site has had some trouble but seems to be working properly as of November 2012. Capital: Agen. Much improved! Online now: civil registrations of the 19th century, census returns, many maps and land records, photographs, old post cards, unique funds of local history and customs, and the recordings of the accounts of some Spanish refugees. Capital: Mende. An all new website! Online: the parish and civil registers from the 17th century to 1902, photographs, maps, post cards, town histories, insinuations. Unusually, the municipal archives of the capitol city are at the same site. Nice little bit of cooperation, that. Capital: Angers. Online: Parish and civil registrations, land records, ten-year indices. NEW! Military recruitment lists, cahiers de doléances and more. Capital: Saint-Lô. Online: Historic maps, parish and civil registrations and ten-year indices, military conscription lists. Click on moteur de recherche, then on état civil. There is a nifty little video explaining how to use the search engine. Paris registrations from 1533 to 1906 for some towns have been indexed on FamilySearch. Capital: Châlons-en-Champagne. New! Online: parish and civil registrations, maps, censuses, and land records. NEW! Military recruitment lists from 1887 to 1896. Capital: Chaumont. Online: finding aids and land records are online. Gradually being added are: parish and civil registers, ten-year indices, and notarial records. Here, one can also read the interesting "Notes généalogiques du Baron de l'Horme". Capital: Laval. Online: parish and civil registers from the 16th century to 1882, ten-year indices, a data base created by volunteers of the details from the marriages of the 19th century, military registers, census lists from 1836 to 1906, land records, transcriptions of marginal notes from the parish registers. Mayenne is acknowledged as the gold standard of departmental archives online. Capital: Nancy. Online: parish and civil registers up to 1882, land records, military recruitment lists from 1887-1921, census returns from 1872 to 1936, probate indices from 1849 to 1945, and letters patent from 1473-1508. As the archives are relocating, all is pretty chaotic, including the website. Capital: Bar-le-Duc. Nice new website design! Online: Parish and civil registers, military conscription lists, census returns, land registry maps, old newspapers, illuminated manuscripts! Capital: Vannes. Online: parish and civil registers, ten-year indices, military conscription lists from 1867 to 1921, maps, photos, 19th century local newspapers. Capital: Metz. Redesigned site! Online: parish registrations, tables to civil registrations, photographs, maps, military recruitment lists. Work is underway to get the civil registrations online. Capital: Nevers. Online: finding aids, list of communes, old post cards, cahiers de doléances, pregnancy declarations, censuses, military conscription lists (recently updated to include the soldiers of WWI), parish registrations and civil registrations are completed. Capital: Beauvais. Online: old post cards, parish maps, parish and civil registers, censuses, military registers. It is necessary to register with the site; this is free. Capital: Alençon. Online: parish and civil registers to 1902, ten-year indices. Capital: Arras. Online: Lots of advice, plus ten-year indices to parish and civil registrations up to 1912, census records from 1820 to 1886, military recruitment records through 1921, land records. Capital: Clermont-Ferrand. Online: All parish and civil records, a wonderful collection of land registry files, images of clerical seals and finding aids, census returns, maps, military conscription lists from 1859 through 1921. Nice new website. Capital: Pau. Now online: land records, finding aids, parish and civil registrations, Jewish registers, some notarial records, military recruitment lists from 1878 to 1921. Capital: Tarbes. Online: Cahiers de doléances, census returns, military recruitment lists, maps, affidavits. The city of Tarbes has put up its parish and civil registers from 1611 to 1909 on www.archives.tarbes.fr. NEW: Parish registers from 1620 to 1792. Soon to enable collaborative indexing. Civil registrations from 1792 to 1915 are expected to be online in January of 2017. Capital: Perpignan. Online : finding aids, civil registrations, military conscription lists through 1921 with alphabetic indices through 1935, census returns. Capital: Strasbourg. Online: parish and civil registrations, and census records, now up to 1912. Also a very interesting discussion of an early 19th century manuscript of a history of Jewish people in Alsace, by Jacob Meyer. Capital: Colmar. Nice new website. Online: the heraldic devices for each commune, a list of those who died in the two World Wars, a list of all of the mairies (town halls), civil registrations from 1793 to 1892, ten-year indices and lists of Jewish names, and the census of 1866. Capital: Mâcon. Online: land records, ten-year indices, parish and civil registers to 1902, censuses from 1836 to 1901, cahiers de doléances, succession tables, post cards, and a nice facility to see all that is available for each town. NEW: Indices to notarial records from 1790 to 1958. Capital: Le Mans. Online: land records, parish and civil records from 1515 to 1892, military conscription registers from 1878 to 1922, manuscripts from private collections, a spoken dictionary (very cool!) census records from 1906 to 1936 (earlier census returns were destroyed), property records, historic maps, and town council minute books from 1787. Capital: Chambéry. Online : maps, some ten-year indices, census records from the 16th to 20th centuries, parish and civil registers from 1501 to 1793 and from 1815 to 1860. Also: some old newspapers, indices to maps, posters, etc. Capital: Annecy. Online: NEW! Parish and civil registrations, censuses and military conscriptions from 1860 to 1940, and maps. Online: index cards to the surviving and reconstructed parish and civil registers to 1860 (the microfilm of these "reconstituted" parish and civil registrations prior to 1860 are on FamilySearch. Patience required. ), birth registrations from 1860 to 1912, marriage registrations from 1860 to 1940, death registrations from 1860 to 1986, military recruitment registers from 1875-1909; lists of the first names of children accepted into care from 1742-1909, ten-year indices for the civil registrations from 1860 to 1984. Beautiful website. NEW! Interment lists for Paris cemeteries. Capital: Rouen. Parish and civil registrations up to 1912 and in some cases up to 1935. Promised soon are maps. Passenger lists of French ships sailing from Le Havre are now online. Capital: Melun. Online: Censuses, ten-year indices up to 1916, notarial records, parish and civil registrations, marriage banns, military conscription lists, World War One photographs. Capital: Versailles. Online: ten-year indices, parish and civil registrations to 1912 (to 1937 for some towns), military recruitment lists, censuses, land records, cahiers de doléances, community monographs (histories), remarkable indices to 114 towns in the arrondissement of Versailles civil registrations covering the years from 1843 to 1912 . Indices to notarial records dating from 1575 to 1899.NEW! Land ownership records -- matrices cadastrales. Capital: Niort. Online: parish and civil registers, land records and census records. Nice, clean site. NEW: military conscription registers are now online. Capital: Amiens. Online: old post cards, seals, parish and civil registrations, censuses, historic maps, local histories, seals, photographs of WWI, and.....(drum roll) a user's guide in English. Just up: military conscription lists. Capital: Albi. Online: some parish registers, civil registers, ten-year indices, land records. It is necessary to register to use the site. Capital: Montauban. Online: Ten-year indices, civil and parish registrations dating back to 1590; military recruitment lists, with alphabetic indices for some years. Capital: Toulon. Online: land records, census returns, parish and civil registrations, ten-year indices, medieval notarial records, architectural records, cahiers de doléances, records about the liberation of Var during WWII, finding aids, a "genealogy database", an index to military recruitment lists from 1887 to 1921 and transcriptions of more than a million pages from the register of land sales. Constantly being updated. Capital: Avignon. Online: parish and civil registrations, ten-year indices, finding aids, maps census records from 1836 to 1906. Capital: La-Roche-sur-Yon. Online: parish and civil registers, censuses, notarial records, land records, old post cards, faire parts, notarial minutes and délibérations municipales, the World War I soldiers from the Vendée. Sadly, these archives have suffered two floods in 2016; the website explains the consequences in great detail. NEW: a database of 13,700 names of members of religious houses from the 18th century to 1903. Capital: Poitiers. Online: parish and civil registers (now up to 1912), land records, the military registrations from 1867-1908, census lists (collaborative indexing in progress), tables of inheritance and probate records. Interesting: A collection of notes on cards made during the 1950s extracting further information on Protestants, abandoned children and more. NEW: notarial records! Capital: Limoges. Online: Maps, finding aids, parish and civil registrations from 1737 to 1912, photographs, a medieval manuscript from Limoges, military recruitment lists from 1878 to 1921, inventories of parish properties from 1905. NEW: census returns from 1836. Capital: Épinal. Parish registers from 1526, civil registers to 1905, ten-year indices, censuses for the years from 1886 to 1906. NEW: military recruitment lists, land records from 1807 to 1913, and town histories (monographs des communes). Capital: Auxerre. Online: parish and civil registers. Census records, and now military lists from 1867 through the First World War. Capital: Évry. Online: Parish and civil registers, censuses, historic maps, and 184 village and town histories written for the 1900 Paris Expo, as well as indices to notaires' minutes. Capital: Nanterre. Online: maps (also for the old department of Seine from 1930 and for Seine-et-Oise from 1960); ten-year indices to the civil registrations through 1932 (but for one town); census records from 1891 to 1911, civil registrations for all towns from 1793 to 1918. Capital: Bobigny. Online: no genealogical records are online, but there are lots of postcards and photos. Capital: Créteil. Online: parish and civil registers, ten-year indices, historic maps, finding aids, census records from 1795 (!) to 1906. Nice, easy site to use. Wonderfully interested, knowledgeable and helpful staff. Capital: Cergy-Pontoise. Online: Parish registrations from the 16th century to 1792, civil registrations from 1793-1900, ten-year indices, and census returns from 1817 to 1975, indices to probate records of Argenteuil from the 17th century to 1914, old newspapers. Capital: Basse-Terre. NEW! Online: Civil registrations and military conscription lists. Site still under construction but very nice. Capital: Fort-de-France. This is actually the website of BNPM - The Banque Numérique des Patrimoines Martiniquais. Online: the actes d'individualité of freed slaves, 1848-1851, military conscription lists from 1889 to 1921. NEW: many, many new registers concerning the slave populations from 1770 to 1899. Capital: Cayenne. Online: finding aids only. Preparation to put parish and civil registrations online is under way. There is an excellent list of links to other research resources. Capital: Saint-Denis. Online: no records are online, but there is a nice new site for the archives. 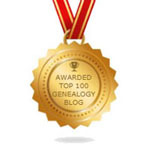 We Are Among Feedspot's Top 100 Genealogy Blogs! Find Us On Cyndi's List! Research by Marc Boleat on the origins of two brothers who moved from Brittany to Jersey in the 1870s, and their descendants. It will be of particular interest to anyone researching relatives in Jersey with a French origin. This is getting rave reviews for it thorough and detailed research. A two-part article in EuskoNews. Very informative! The mémoires of Henri Soudée and of his parents. Soldiers, Communards, and immigrants to Martinique and the United States, their tales are fascinatingly gathered by our Dear Reader, Françoise Becker. WHERE in France Was Your Ancestor From? If a search brings you to a blank page, that post has been published in one of our booklets, (shown in the right-hand column) and is available for purchase.